Looking for a fun way to make and drink hot cocoa? 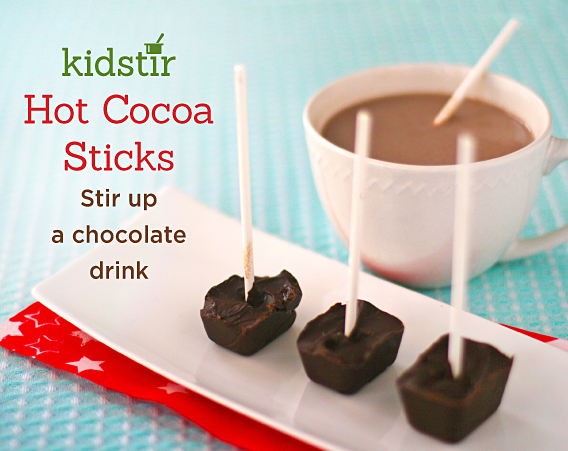 Make hot chocolate on a stick and stir it into a cup of steamed milk! 1. Pour the chocolate chips into a microwave safe bowl. Microwave on high power for 1 minute. Stir the partially melted chips, then microwave for another 30 seconds and stir again. If they're still not melted, return the bowl to the microwave and zap the chips for another 30 seconds or until melted. 2. Add the cocoa powder and confectioners' sugar to the melted chocolate and stir it all up again. 3. Carefully pour the chocolate into a lightly oiled ice cube tray. Add a lollipop stick to each cube. Refrigerate until hardened. 4. When you're ready for hot cocoa, pop the stirrers out of the ice cube tray. Then warm up mugs of milk and stir with the Hot Cocoa Stirrer until the chocolate melts and the milk is chocolatey.